Last week I showed Jonah Kohn, Google Science Fair winner (13-14 category) around the CMS experiment cavern. Since he's also a guitarist, we arranged a little surprise for him and had an impromptu jam session with the CMS guitar! Now that was major fun! We jammed for 10 or 15 minutes, going through various rock "standards" and just jamming on improvised riffs. 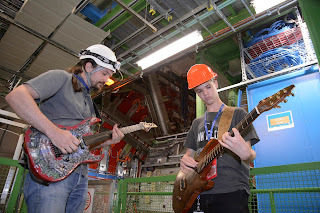 And the guitar got to see CMS in person finally too. Read more in the CERN news!